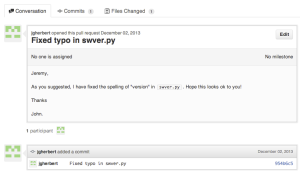 In Monday’s post about installing the Juniper EZ Python library on Ubuntu I noted a typo in the word “version” in one of the modules and casually called on author Jeremy Schulman to fix it. 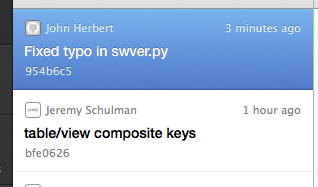 Jeremy had other ideas though, and in the true spirit of collaborative development, challenged me to fix it myself. I think that is a terrific idea (wish I had thought of it, in fact) because I’ve been meaning to look at Github for a while and never quite got around to it. Plus, let’s face it, the great thing about open source development is that anybody can fix anything, isn’t it? Why should Jeremy fix minutiae like this when I could fix it, and leave him more time to work on more important things? I am empowered! This post, then, is a quick newbie’s guide, written by a newbie (me), on how to get set up with github so that I can make my first changes to Jeremy’s Juniper EZ library project. 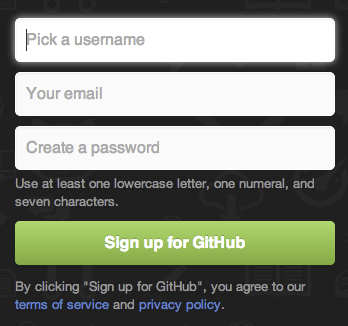 Creating an account on GitHub.com is incredible simple (in fact, it doesn’t even ask you to repeat your password, which is slightly concerning!). When you go to github.com as an unregistered user, you will see the account creation right there on the home page; all you need is a username, an email and a password. Once you’re logged in to github.com, there is help to get you started right there on the landing page in the form of the “GitHub Bootcamp”. Curiously, the first thing on the Set Up Git page was a suggestion to “Forget the terminal. Download our native app instead.” I followed the download link, expanded the archive to get a file called github which, when run, offers to move itself to the Applications folder. Logging in, you have a chance to configure the name and email that will be used on your code check-ins. You also get an option to install command line tools, which I chose to do. The native (GUI) app turns out to be a rather lackluster replacement for the command line, and unless I’m missing a lot of commands somewhere, much of the process I followed had to be executed at the command line. Perhaps somebody with more experience than I can tell me if that’s a fair summary? One of the links offered on that first help page was a crash course to learn about Git, which was equally well written and easy to follow. I found that to get things working, I had to pull a bit of information from the Bootcamp and some from the Crash Course documentation. That sounds perfect. It seems that in order to fork the repository, I have to go to the Github website and make the fork there as there isn’t an obvious way to do this in the GUI client. 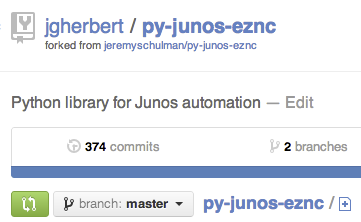 While logged in, I browsed to Jeremy’s py-jnpr-eznc project and clicked Fork. Initially the forked project only exists on GitHub.com, so within the native app I clicked on the “GITHUB.COM” tab then clicked on the refresh icon at the bottom. To get a copy of the repository, I selected the “Clone to computer” option, and chose a destination directory. Note that I’m cloning my fork of the project, not the original project. The idea of configuring an “upstream” repository is that when Jeremy makes changes to his project I can get those changes easily brought over to my forked project (either updating my files automatically, or via a manual merge process). In this case, I want to make a really simple change – fixing a typo I noticed in one of the modules’ outputs (“versino” instead of “version”). So let’s try making that change in my forked repository. In the shell (terminal window), I browsed to the repository and then to the directory containing the file I wanted to edit. Reading between the lines (haha, see what I did there?) the diff output shows the code before and after the actual change, then indicates the old line (prefixed with ‘-’) and the new line (prefixed with ‘+’). john@Max:~/py-junos-eznc/lib/jnpr/junos/facts$ git commit -m "Fixed typo in swver.py"
Writing objects: 100% (7/7), 556 bytes | 0 bytes/s, done. Yeah! I just committed a change to my forked project! However, that does nothing for Jeremy, and I want him to incorporate my change into his project . The diffs shown further down the page were correct, so I clicked on the text saying “Click to create a pull request for this comparison”. 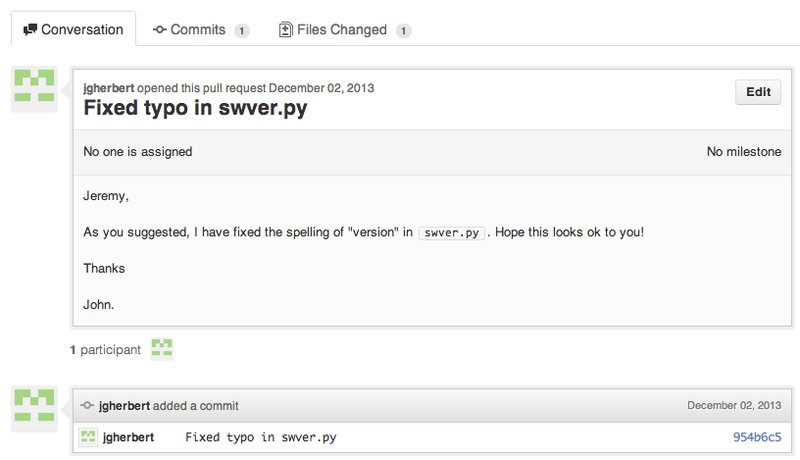 A pull request is a way for me to ask Jeremy to consider merging my change into his project. It’s a neat system because it protects the main repository (owned by Jeremy), but allows me to submit potential updates for him to review and (hopefully) approve. I then had a chance to write a comment about my proposed change. Effectively this begins a Conversation between Jeremy and I so that if discussion is required, it can be kept neatly along with the proposed change. That was kind of fun, and didn’t take very long to set up and get working. Most importantly, this showed me that GitHub is way less complex than it might seem at first and it turns out to be remarkably easy to contribute to a project this way. I’m not entirely convinced that the native (GUI) app has much of a place in my nascent workflow; most of my changes were on the command line, which was a little disappointing. It’s a little sad, perhaps, to be excited about checking in a typo correction, but as somebody who has not contributed to an open source project like this before, I can’t help myself (regardless of how utterly inane my contribution was)! Hopefully I can find way to be useful in the future, and use my newly-gained GitHub chops for the betterment of the world, or some equally lofty goal. If you’ve been uncertain about GitHub, I really hope that this has given you some small insight into what an easy process it can be at a basic level, and perhaps by bringing together enough commands to follow through one process like this, you’ll take the plunge too in the near future! Thanks again to Jeremy Schulman for throwing down the gauntlet – this was a really fun task! Excellent post, John. I just tried it and it worked great. That’s great! I’m watching the project, so I was delighted when I saw a notification saying you had submitted an update. Thanks for coming back and letting me know. Hopefully we can get even more people on board and contributing. Thanks for this post! I used it for my first github pull request, you made it very easy to follow. I’m thrilled to hear that! Thanks so much for the feedback, and welcome to github!